Though the 12 Steps have worked for many, numerous studies have concluded the success rate of the AA is as low as 5%. If you are one of the 95% who have tried but continue to struggle, this eBook is for you. You have options, and there is hope. 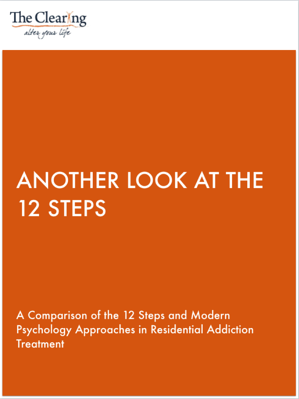 We compare and contrast the 12 Step approach to other modern evidence-based psychology approaches. We've learned much in the field of psychology related to addition in the past few decades. This eBook will introduce you to alternative perspectives on healing. A new perspective on empowerment: you are not powerless! * This approach has helped us achieve a self-reported 80% success rate from participants of The Clearing's residential treatment program.